Strings are what make a group of traditional instruments into an orchestra. Remove them and you have a band. That, at least, is one way to categorize these two ensembles. Definitions of music ensembles can be simultaneously strict and flexible. 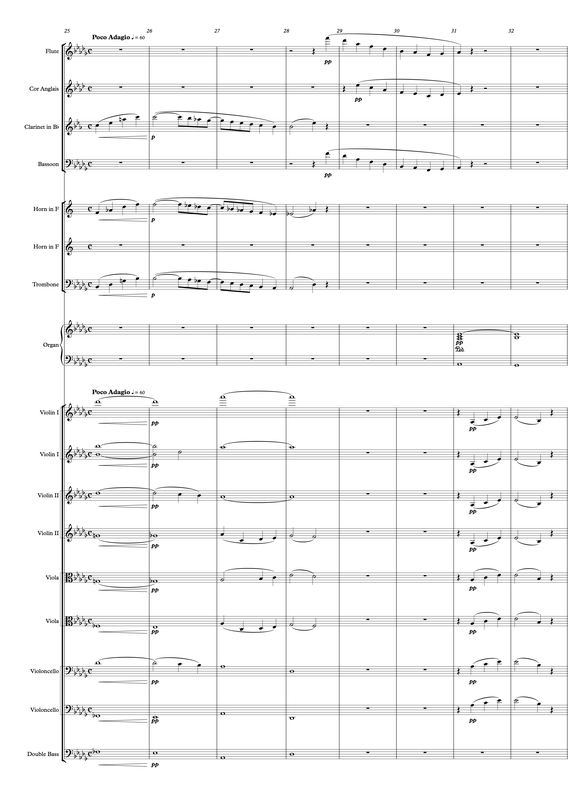 Historically, scoring for orchestra often has been at the mercy of the budget. Composers of the seventeenth and eighteenth centuries were generally limited by the constitution of the string section, but the kind—and technical and musical abilities—of wind players was also necessary information for the composer. Examining the instrumentation of almost any orchestral work by the masters, one rarely sees strict adherence to one format. Yes, the string section sticks to the fairly standard grouping of two violin sections, one each of viola, cello and double bass. Although there came to be some standards in the nineteenth century, the composition of winds was still in a somewhat fluid area. Due to the physical nature of the instrument, each one brings a unique sound to the orchestra, one that permits a composer to blend, enhance and exploit its special characteristics. The passages for this post range from Beethoven to Tchaikovsky and all of them premiered in the nineteenth century. Although the examples begin in a chronological order, the arrangement takes a turn after an excerpt from Bruckner’s last symphony. Regardless of their order, I think you’ll enjoy the passages and listening to them in detail should be edifying. 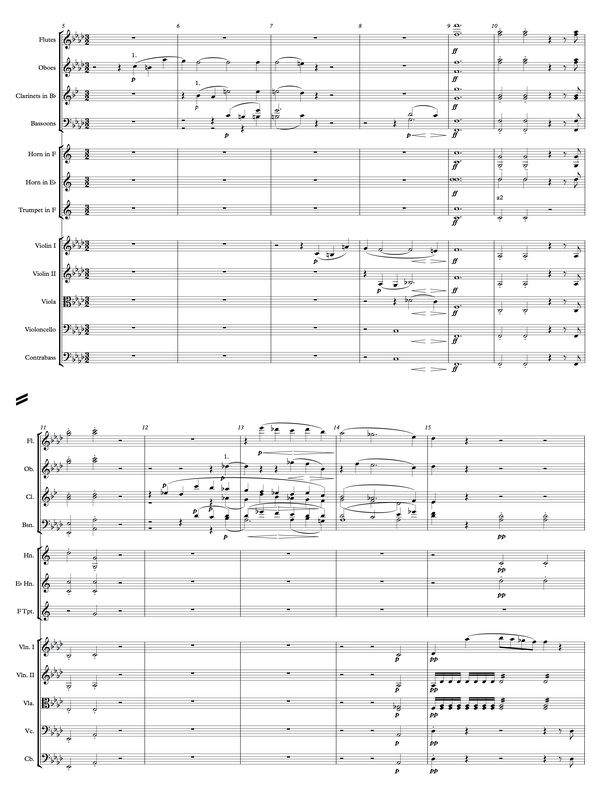 Example 57.1 begins just after the opening of the full orchestra ends and the composer focuses on the woodwinds. After a brief silence, the oboe enters on C, the fifth of the tonic, moves down a half-step to B-natural, leaps up a diminished seventh to A-flat and then down another half-step to G. This same outline is then followed by a similar passage in the clarinet. Beethoven then accelerates the interlude, bringing in a bassoon earlier in the phrase, ultimately adding a second bassoon so the section can resolve on the C major (dominant) chord on the second beat (in three) of measure seven. Click for full sized score. The strings are up next as they have a similar but shorter passage in measures seven and eight. 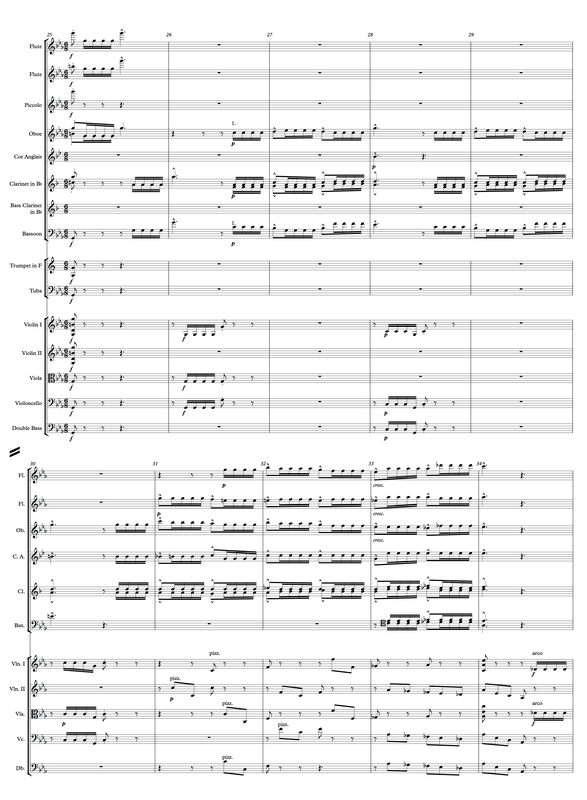 The composer then returns to the opening few measures with a tutti passage that, unlike the earlier one, ends on the relative major, A-flat in measure eleven. Again, after a few moments of silence, the woodwinds return with an extended passage similar to the one heard in measures five through seven. This time, the brief thematic idea (step down, leap up, step down) is introduced in the clarinet. On this return, though, the composer more quickly adds additional winds. It’s notable that, although the double reeds begin to enter after just two notes, the timbre is rich and woody, with the clarinet imbuing the sound with its unique tonal quality. This, of course, is a function of the voicing of the first clarinet on top of all the other lines. However, the lower voices, combining both leaps and stepwise motion, contribute to the richness of the passage. 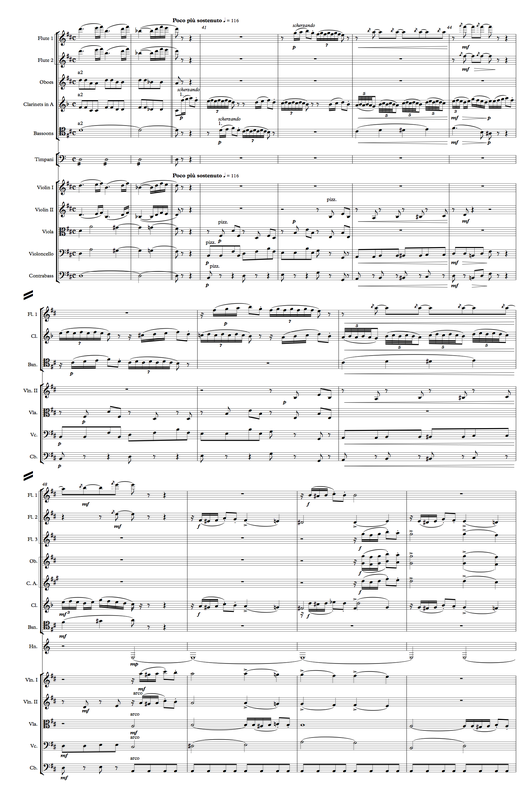 When the flute joins the wind ensemble, high above the other voices in measure thirteen, it is less a “new entrance” than an addition to the vibrant in-progress, linear activity. Noteworthy too, are entrances Beethoven provides on the off beats to keep the energy created by the rhythm. The entrances can be heard both on the fourth and the sixth quarter notes of measure twelve, and the second and fourth quarter notes of measure thirteen. Finally, in the last measure of the phrase, the oboe enters on the second quarter note. The ensemble resolves the phrase to move to D-flat with the A-flat seven chord on the final the quarter note of measure fourteen. In this brief passage, Beethoven provides a useful source for anyone wanting to learn about woodwind writing. If you’re unfamiliar with the work, I recommend spending a little time with this early eighteenth century overture. Felix Mendelssohn wrote the Overture to his incidental music for Shakespeare’s A Midsummer Night’s Dream in 1826 at the age of 16. The remainder of the music was written seventeen years later for a production of the play in Berlin. The Scherzo—which, according to the score, is intended to be performed after the first act—is scored for pairs of woodwinds, pairs of horns and trumpets, timpani and strings. Mendelssohn begins the movement in a similar manner as the opening of the overture with winds only. For the Scherzo, as one would expect, the playfulness of the music is apparent immediately. As you can hear in Example 57.2 Mendelssohn begins in close harmony with staccato flutes and clarinets. The harmonies are so close, in fact, that the clarinets’ lines are in the same sonic space as the flutes. It makes sense that this is a way to maintain these tight harmonies. If the composer had put the clarinets down an octave the parts would have a “bigger” sound, but the timbre would not have matched as well. If he had given the oboes the same lines in the same space, they would probably have overwhelmed the flutes. So the composer decides to put them close together. In fact, there are many places where the flutes’ lines go below the repeating homorhythmic notes of the clarinets and still the melody is obvious. At measure five, the composer maintains the four woodwinds and puts the flutes on a pedal D with the clarinets harmonized in sixths. Of course, the pedal here is above, not below, the soli activity of the clarinets. It’s not until measure nine that we hear all of the woodwinds supported by the two (crooked) horns, but still Mendelssohn stays only with the winds for the second eight bars. On this replaying of essentially the same material, the composer fleshes it out giving the two oboes the parts played earlier by the flutes and giving the bassoons the parts played previously by the clarinets. The horns appear to be here simply to round out the sound and assist the bassoons in the rhythmic impetus, especially in measures 13 and 14. It’s interesting from a compositional point to note that the composer uses more of the range of the clarinets when, in measures 15 and 16, he extends the upward staccato scalar lines for more than two octaves. Clarinets offer the composer the versatility to both soar when required above high C and still be able to drop nearly an octave below middle C.
And finally when the strings enter in measure 17, they exactly repeat the opening lines introduced by the flutes. The rest of the winds are now employed to provide the accents and harmonies, accompanying the horns and lower strings. Mendelssohn does an appropriate job in supporting the Shakespeare story here. After the first two acts we’ve been introduced to a couple of the plots involving the young lovers as well as the inept but lovable townsmen. Our interest in the play has only just awoken. We have yet to meet the deities, sprites and fairies. Mendelssohn carefully ends the first act with a nod to the playfulness of the nighttime and wisely gives us just a hint of what is to come. The composer balances the interplay of the strings and winds in the four or five minutes of this charming scherzo. Camille Saint-Saëns lived a long, productive life. Although he wrote operas, chamber music, sacred choral music, as well as a number of concertos, possibly his most performed orchestral work is his Symphony Number 3, often referred to as “the Organ Symphony,” first performed in 1886. 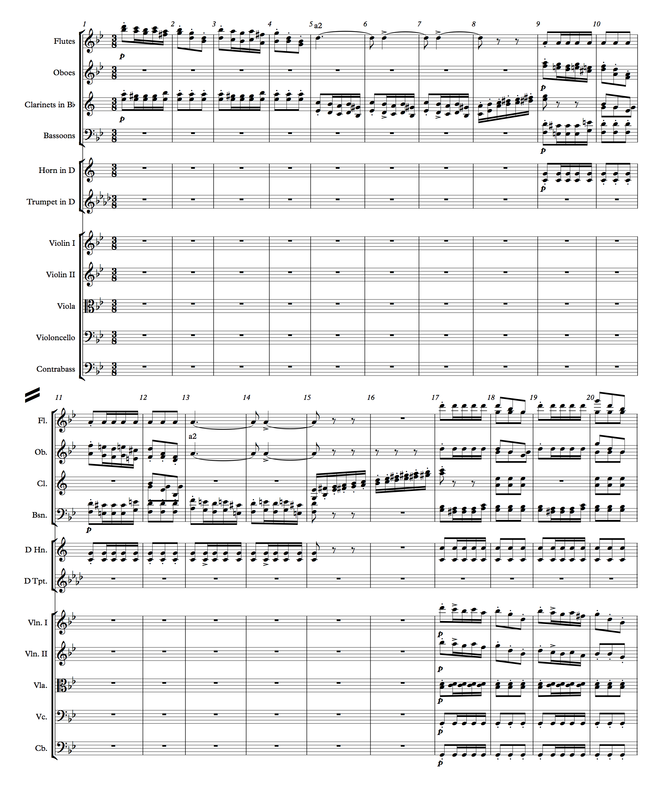 It is scored for a full orchestra including triple woodwinds, four horns, three trumpets, three trombones, tuba, and piano (for both two and four hands! )—as well as the infamous organ. Following up on the Mendelssohn scherzo in the previous example, it’s of interest to see what a composer born a quarter of a century later does with a rapid, staccato triple pattern. Although the music is far from the playfulness of the Mendelssohn and does not offer any of the scalar passages, rhythmically it’s quite similar. After the octave leaps in the winds and strings in measures 25 and 26, the phrase picks up with the oboe on top, the bassoon on the bottom and the two clarinets filling out the harmony in between. With the quartet of winds here playing short notes, it’s not easy to discern the timbral characteristics of the sound. It requires dedicated listening to perceive the instruments without seeing the score to confirm the sources. There is a sense that the composer brings in the cor anglais just to play the third of the two C chords (first minor, then major) on the downbeats of measures 28 and 30 so that our ears assure us that we’ve changed keys, at least temporarily. The melody gets easier to perceive in the next section as the oboe leaps from the G to the C and then descends a fourth, the pattern repeating (down a second) in the ensuing measure. In the example I point out the way Saint-Saëns has the flute sneak in, first doubling the oboe on the melody late in measure 31 and then jumping up to play it alone after the downbeat of measure 33. This is a useful technique for gently introducing a new timbre. In a few of Anton Bruckner’s symphonies, the composer swaps a lively third movement with a slow second movement. This is the case with his Symphony Number 9, his final symphony, left unfinished at the time of his death in 1896. The passage in Example 57.4 is from the adagio and has some simple yet elegant writing for winds not too far into the movement. After a passage in the strings provides elements of the ideas the composer wants the winds to play, the strings end at the last eighth note of measure 48. One flute, one oboe and three clarinets enter in their upper registers. The oboe and flute are in unison, yet the tune they are playing emphasizes the flute much more so than oboe. This could be a function of this recording, but it’s probably the fact that the oboe is quite high in its range and its reediness is not nearly as apparent this high. The flute, on the other hand, is in a cantabile portion of its range. To my ear, the composer’s background as an organist is apparent here. The first clarinet has a kind of antiphonal pattern to that in the oboe and flute line. The second and third clarinets have a descending scalar line that reflects the lower strings just before this example begins. It’s notable that the third clarinet emphasizes the rhythm of the first on beats two and four of each measure. Once the reeds have their moment in the spotlight, Bruckner shifts the focus to the four horns. The third and fourth players enter on the minor third E-flat – G-flat, but on the next beat the first horn enters on the same G-flat. The lines expand outward in the next few beats as the second horn enters, also on the G-flat, while the first horn moves up in a scalar pattern and the third and fourth move down. These tight harmonies are growing apart before our ears until the next measure’s changes in the first and second horns’ half note chords. It’s well known that Bruckner was always revising his symphonies. Here is an example that shows the composer’s command of this section; this rightfully abnegates any need to add more instruments into the score in this passage. 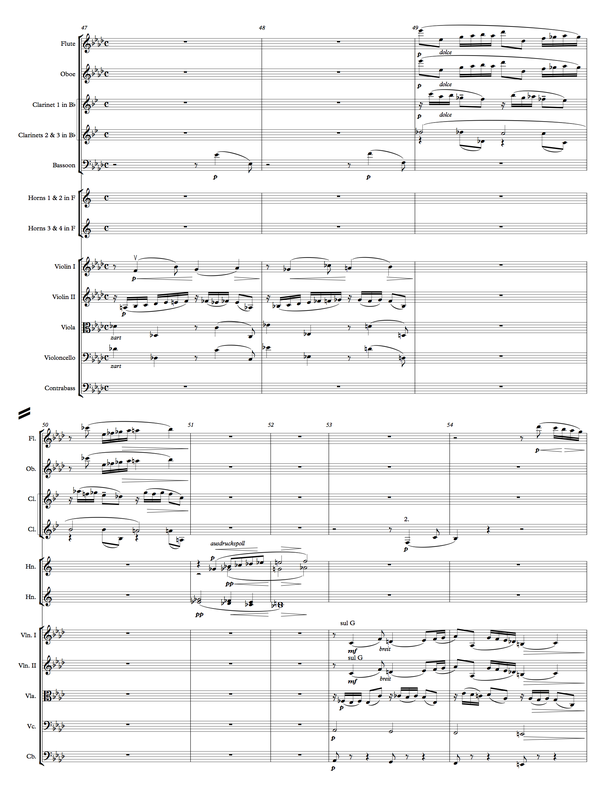 When the strings enter in measure 53, the composer opts to influence the string sound with a few slight woodwinds in that measure and the next. The passage shows how linear melodies can be combined through a variety of winds to make a unique and satisfying sound without relying on the strings. We earlier listened to an example from the final movement of Saint-Saëns’s third symphony; it was rhythmically similar to the Mendelssohn A Midsummer Night’s Dream Scherzo. This next example is also from Saint-Saëns’s third symphony, but from the earlier, adagio movement. What makes this noteworthy is the way the composer decides to have his melody played in three octaves by winds. Then, he chooses a couple of infrequently heard combinations of those winds. Regardless of the individual performance, using three octaves for a unison wind line with no wind harmonies is a less than obvious choice. One of the reasons it works well here is because the strings are divided into quite a few parts, leaving the openness of the winds to be heard clearly. When the first of the two phrases ends in measure 28, the second phrase begins, this time with flute, English horn and bassoon. This combination is more frequently heard. Here, though, the composer has the lines in three octaves with no harmony whatsoever. It’s a pleasant sound with the bright metallic flute on top and the double reeds below it. One final note: when the strings (all but the double basses) reenter in measure 31, the composer now has them playing in unison, not in two or three octaves. No, this entrance includes all the violins, violas and cellos in unison. Given the unusual pairings of the previous two phrases, when the backbone of the orchestra—the strings—now return, their unison sound adds a new color to this passage. There’s a brief passage at the end of Scene 12 (in the second act) of Pyotr Ilyich Tchaikovsky’s ballet Swan Lake, which had its premiere in 1877. The passage comes just before the array of dances of the swans. Just from its texture one can immediately infer that it is a transitional bit of music. Listen to Example 57.6 and hear for yourself. The composer blends a similar group of winds to that in the Bruckner excerpt from above. The two flutes enter in their topmost octave with support from two oboes and, at first, just one clarinet. There is a transparency to the passage as the first flute plays the two beat dotted-eighth, sixteenth, quarter note while the remainder of the woodwinds have chords in a supporting role. The transparency is primarily derived from the high ranges of the background or lower instruments. While the first flute plays the cantabile line on top, the second flute and two oboe parts are written in close harmony below it. For the oboes, playing in this higher register diminishes some of the characteristic reedy and nasal sound of the instrument. As the passage continues, the clarinet and oboe parts intertwine for a few beats and then Tchaikovsky removes the second flute, adding a second clarinet to change the overall timbre and make the overall passage richer and a little more interesting. After the first few measures, the bassoon enters on the whole note C-sharp just as the flute hits and sustains the same note two octaves higher. 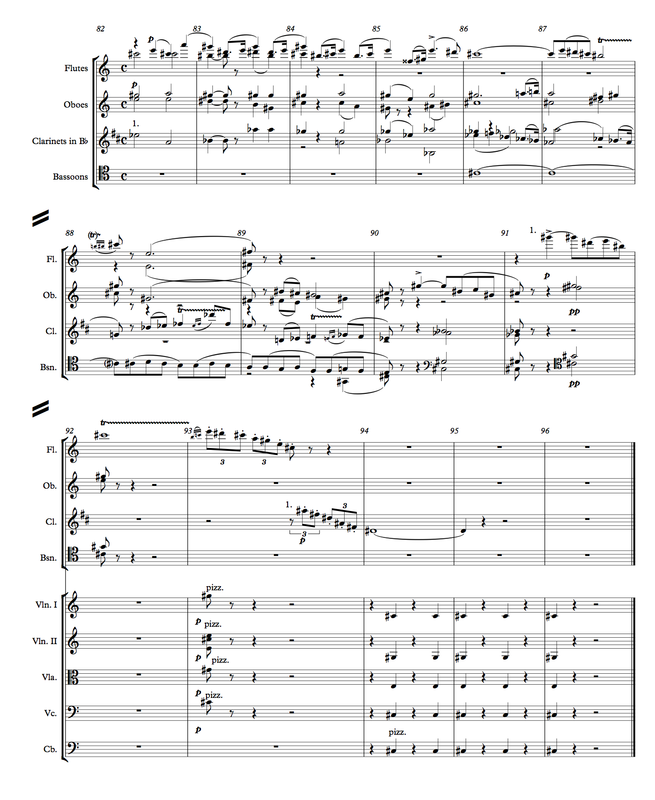 Note the substantial change in timbre as the clarinets and oboes fill in the movement of the measure. The passage continues after the flute trill as the bassoons begin to add movement in their eighth notes just below middle C, the temporary bottom of the orchestra. The effects that first the oboe and then the flute have hitting their G-sharps solo on the second beat of measures 90 and 91 are refreshing and create a brief, novel sound to the playful woodwinds. Finally, note the light, but functional use of the string pizzicato on the downbeat of measure 93. It’s a tiny detail, but after twelve measures with no strings, bringing them in on a pizzicato chord adds to the interest as the end of the phrase arrives. Among the ingenious facilities he possessed, are the ways Tchaikovsky writes for winds, often developing a synergy with his creative tunes. In this next example, we hear how he interweaves similar ideas among his woodwinds, eventually bringing the same ideas to the strings. Before listening to the example, though, it helps to put the passage in context. Example 57.7 (discussed in my post of December 29, 2014, Post 44) provides the opening of this scene. With that reference for this scene, listen to Example 57.8, which takes place some thirty or forty measures later. The first thing to note is the short idea, first presented by the clarinet, then, before it’s even done, the bassoon enters with the same idea. A measure later the clarinet repeats the idea and this time the flute enters half-way through. What delights the ears here, in addition to the fresh thematic material (after the first section), is the thematic idea itself presented in the middle of each of the instrument’s ranges. The timbres are distinctive and virtually undisturbed by any other sounds in their sonic range. The only accompaniment here is the provided by pizzicato strings. It’s not until measure 43 that the bassoon begins an ascending scalar line, harmonizing with the ascending pizzicato strings. It adds to the interest that the flute part in this measure actually has a pedal A, normally sustained but in this case Tchaikovsky has it reiterated on the offbeat with a grace note. This is the kind of detail that is so often lacking in lesser orchestrations. Finally, after this pattern is repeated, the now arco violins have the beginning of the idea. This time, though, it’s quickly answered by a flute and clarinet, then by the violas, then back to a flute and clarinet, and thus the composer continues. It’s not that the theme here is particularly laden with germinal ideas. It’s the way the composer chooses to employ them and distribute them around the orchestra to enhance the color with each entrance. I hope you’ve enjoyed the examples in this article focusing on woodwinds. I plan to return focus to the Kitchen Sink series (sort of) in my next post.